Amazon Web Services load balancer solutions like the AWS Elastic Load Balancer (ELB) or AWS Application Load Balancer (ALB) lack full-featured load balancing capabilities, multi-cloud traffic management, and real-time application analytics. 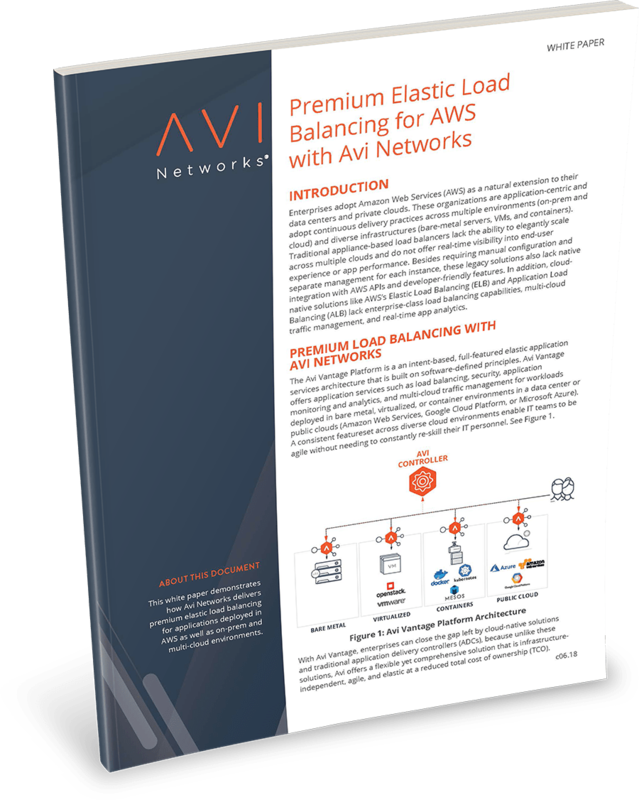 Similarly, traditional appliance-based load balancers are not designed for cloud environments, since virtual appliances lack the ability to scale across multiple clouds and cannot support the elasticity and automation required by cloud-native applications. These legacy solutions also lack developer-oriented features and native integration with AWS APIs, and require manual configuration and tedious management of individual instances. The Avi Vantage Platform offers full-featured load balancing, multi-cloud traffic management, application analytics, on-demand autoscaling, advanced security, application monitoring, and more. Avi also deploys in bare metal, virtualized, or container environments, delivering enterprise-grade services far beyond those of AWS load balancers (AWS ELB / ALB) or virtualized legacy appliances. Looking to modernize and maximize your application delivery and networking services in AWS? Learn more about delivering multi-cloud networking and application services with the Avi Vantage Platform that go beyond AWS load balancer capabilities. Discover how Avi Vantage delivers analytics-driven autoscaling and lowers TCO for AWS deployments. Learn how Avi Vantage integrates natively with AWS to deliver elasticity, automation, and analytics.